Burma will allow alleged victims of forced labour to seek redress without fear of persecution, the UN has said. The International Labour Organization said Burmese authorities had acceded to its request as part of efforts to ensure abuse claims were investigated. While only a trial agreement, it will be seen by campaigners as an advance in the fight against the practice. 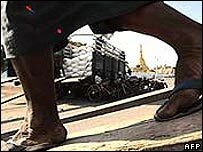 Burma denies allegations of forced labour, although there is evidence that it continues to take place. The Burmese government threatened to leave the ILO in 2005 after saying its efforts to give a means of redress to complainants were unacceptable and a breach of its sovereignty. But the ILO said it had concluded an "understanding" with Burma that alleged cases of forced labour could be reported and investigated without fear of retaliation. Under the terms of the agreement, alleged victims will be free to submit complaints to the ILO's liaison officer in Rangoon on the understanding that the authorities will investigate them and take "appropriate action" against anyone found guilty. It has also been agreed that the ILO's representative will be free to meet complainants and talk to others with relevant information. "The mechanism will be implemented on a trial basis over 12 months and may be extended by mutual agreement," the ILO added. The BBC's Kate McGeown in Bangkok said the move was designed to prevent past cases where people who had sought the ILO's help had been tracked down by the authorities and punished. The ILO has repeatedly said that forced labour remains a serious problem in Burma, with evidence pointing to ethnic minorities being most vulnerable.